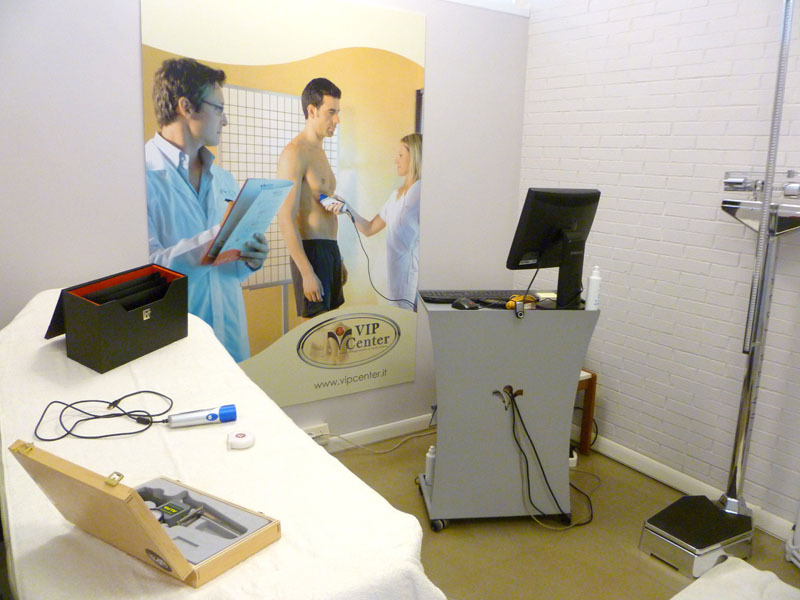 The treatments’ planning is done through a careful and personalized body evaluation in order to determine how to act in specific areas of the body. Instrument capable of measuring the thickness of the epidermis, consisting of the skin fold and of the fat contained in it. The comparison, over time, of the measurements, allows to underline the difference of the thickness and then the improvements that take place thanks to the treatments. One-dimensional ultrasound system which uses the ultrasound technology and is perfectly capable of measuring the fat thickness in a single point and therefore allows the measurement in a localized way. This is a tool that guarantees a perfect repeatability of the measurement because is not influenced by external mechanical and hydration factors. A tool that allows to give the correct expectations of the results by measuring the arm and the contracted calf muscles. An essential tool for the detection and classification of the stage of cellulite. The telethermography is based on the use of E.L.C. plates (micro-encapsulated liquid crystals), which change color with temperature variations. The presence and stage of cellulite is highlighted on the plate by the color and by the image composition. The plate is read by an experienced operator in order to proceed with the planning of the most suitable treatments. The photo detection is performed with special and exclusive instruments made ​​by the parent company and following a protocol that ensures reliability and precision of results. - Display the results obtained with specific graphics to be compared periodically. - Create a strong motivation to continue with perseverance the treatment program. - Give strong credibility and confidence in the method and in the staff. The program of the VIP Center’s customer begins with an initial interview to identify immediately his/her needs. During the next step the technical manager performs a thorough computerized physical evaluation with highly professional tools and which is repeated every ten sessions in order to verify the improvements. With our scientifically tested method it is possible to fully satisfy the needs of people. We also recommend to follow a proper diet with the help of the Nutrition Guide created in collaboration with Dr. Luca Deidda, who ensures to those who attend the VIP Center not only the achievement of the desired results but also their maintenance.